Picture - Transfer of ammunition from standard-gauge railway to trench railway during the Battle of Passchendaele. Picture - BL 9.2 inch Howitzer with shells lined up on the ground recently delivered from the trench railway in the foreground. 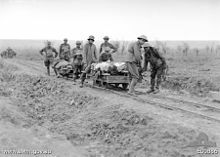 Picture - 5th Australian Field Ambulance Company soldiers evacuating wounded from the front near Ypres in trench railway hand cars. Trench Railways represented military adaptation of early 20th century railway technology to the problem of keeping soldiers supplied during the static trench warfare phase of World War I. The large concentrations of soldiers and artillery at the front lines required delivery of enormous quantities of food, ammunition and fortification construction materials where transportation facilities had been destroyed. Reconstruction of conventional roads and railways was too slow, and fixed facilities were attractive targets for enemy artillery. Trench railways linked the front with standard gauge railway facilities beyond the range of enemy artillery. Empty cars often carried litters returning wounded from the front. 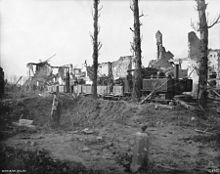 Picture - Australian 17th Light Railway Operating Company ballast train near Ypres pulled by Cooke 2-6-2 tank locomotive # 1217. France had developed portable Decauville railways for agricultural areas, small scale mining, and temporary construction projects. France had standardized 60-centimenter gauge military Decauville equipment and Germany adopted similar feldbahn of the same gauge. 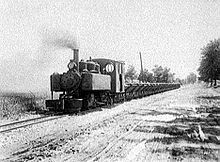 British War Department Light Railways and the United States Army Transportation Corps used the French 600 mm (1 ft 11⁄8 in) gauge system. Russia used Decauville 600 mm (1 ft 11⁄8 in) and 750 mm (2 ft 5⁄2 in) systems. Unskilled laborers and soldiers could quickly assemble prefabricated 5-meter sections of track weighing about 100 kilograms along roads or over smooth terrain. The track distributed heavy loads to minimize development of muddy ruts through unpaved surfaces. Small locomotives pulled short trains of ten-tonne capacity cars through areas of minimum clearance and small-radius curves. Derailments were common, but the light rolling stock was relatively easy to rerail. Steam locomotives typically carried a short length of flexible pipe (called a water-lifter) to refill water tanks from flooded shell holes. Steam locomotives produced enough smoke to reveal their location to enemy artillery. Steam locomotives required fog or darkness to operate within visual range of the front. Daylight transport usually required animal power until internal combustion locomotives were developed. Large quantities of hay and grain were carried to the front while horses remained an essential part of military logistics. Picture - A wagon for transporting artillery shells. A rectangular water tank car is in the background. Captain P�chot of the French Artillery designed a 10-tonne Fairlie articulated 0-4-4-0T locomotive. The French military had 62 P�chot-Bourdon type built between 1888 and 1914. Baldwin Locomotive Works built 280 more during the war. Two-hundred-fifty 8-tonne 0-6-0T of Decauville's Progres design were built for military service. Thirty-two 0-6-0T of American design and six-hundred 55 kW gasoline mechanical locomotives were purchased from Baldwin Locomotive Works. Picture - A 0-8-0T Brigadelok preserved at Deutsches Dampflokomotiv-Museum. The Maginot Line employed a 600 mm (1 ft 11⁄8 in) gauge supply system of gasoline-powered armored locomotives and underground electric locomotives pulling cars of World War I design. Two P�chot-Bourdon locomotives were preserved in the technical museums of Dresden and Prague. 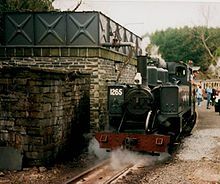 A portion of the Somme battlefield railway continued in operation and has been preserved as the heritage Froissy Dompierre Light Railway. Picture - German troops loading for transport to the front about 1915. Orenstein and Koppel GmbH manufactured portable track. Krauss designed a 0-6-0T Zwillinge intended to be operated in pairs with the cabs together. The Zwillinge offered Mallet locomotive performance through tight curves, but damage to one unit would not disable the second. One-hundred-eighty-two Zwillinge were manufactured from 1890 through 1903, and shortcomings were evaluated in German South-West Africa and China's Boxer Rebellion. An 11-tonne 0-8-0T Brigadelok design with Klein-Linder articulation of the front and rear axles was adopted as the new military standard in 1901. Approximately 250 were available by 1914, and over two thousand were produced during the war. A Brigadelok typically handled six loaded cars up a 2% grade. 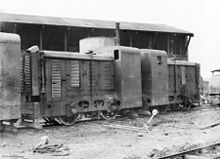 Picture - A pair of trench railway tractors in the Minico yard of the Australian 17th Light Railway Operating Company during the Battle of Passchendaele. Germany also had approximately five-hundred 0-4-0T, three-hundred 0-6-0T, and forty 0-10-0T locomotives of other designs in military service. 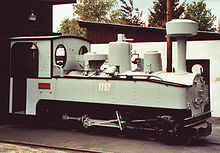 Deutz AG produced two-hundred 4-wheel internal combustion locomotives with an evaporative cooling water jacket surrounding the single cylinder oil engine. Fifty similar 6-wheel locomotives were produced by Deutz. Approximately 20% of the Brigadeloks saw postwar use. Government railways of (Yugoslavia), Macedonia, Serbia and Poland made extensive use of the military locomotives. Significant numbers were used in Hungary, France, Latvia, Bulgaria, and Romania while smaller numbers went overseas to Africa, Indonesia, Japan, and North America. 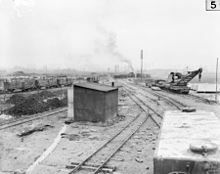 Picture - This 1917 photo of the Poperinge yard of the Australian 2nd Light Railway Operating Company shows a water tank car in the right foreground. Behind the tank car is a partially armored, 16-wheel, hand-operated light railway crane capable of lifting 6 tons. The crane was built by Ransomes & Rapier of Ipswich, England. Cars in the left background appear to be loaded with crates of food or ammunition. Britain selected a Hunslet Engine Company 4-6-0T design as their standard for the French rail gauge; but Hunslet's production of 75 locomotives was insufficient. Baldwin Locomotive Works produced 495 15-tonne 4-6-0T of a less satisfactory American design while Hudswell Clarke and Andrew Barclay Sons & Co. built 83 0-6-0T locomotives. One-hundred 15-tonne 2-6-2T of the American standard military design were later purchased from ALCO's Cooke Locomotive Works for British use. Britain pioneered use of gasoline powered, 4-wheel synchromesh mechanical drive locomotives called tractors for daylight use within visual range of the front. Early tractors weighed 2 tons. Total production was 102 7-kW Ernest E. Baguley tractors, 580 15-kW Motor Rail tractors, and 220 30-kW Motor Rail tractors. An additional two-hundred 30 kW gasoline-electric tractors were produced by British Westinghouse and Kerr Stuart. 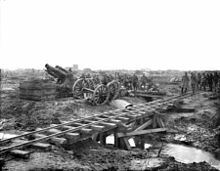 Former British trench railway equipment was put to civilian use rebuilding Vis-en-Artois between Arras and Cambrai. Twenty Hudswell-Clarke and Barclay 0-6-0T, seven ALCO 2-6-2T, and 26 Baldwin 4-6-0T saw service through 1957. Baldwin Locomotive Works produced 15-tonne (16.5 ST; 14.8 LT) 2-6-2T numbered 5001-5195. Number 5195 was sent to Davenport Locomotive Works as a pattern for their production of the design, while another was sent to Magor Car Campany to test operation of their military railway car production. Two were lost at sea, and the remaining 191 saw service with the U.S. Army in France. Locomotives were initially painted grey with black smoke boxes. White lettering was applied to early production, but black lettering was used in France. Baldwin also built 5-tonne 26 kW and 7-tonne 37-kW 4-wheel gasoline mechanical locomotives for the U.S. Army. The lighter locomotives were numbered 8001-8063. The heavier locomotives were numbered 7001-7126 and operated at 2 metres per second or 6.56 ft/s (7.2 km/h/4.5 mph), roughly the speed of a slow jogger. The standard American military railway car was 170 centimetres (5.6 ft) wide and 7 m (23 ft) long riding on two 4-wheel archbar bogies. 1,695 of these cars were built by Magor Car Company, American Car and Foundry and Ralston Steel Car Company. Most were flatcars, but some had gondola sides, others had roofs (either with open sides or like conventional boxcars) and others carried shallow rectangular tanks with a capacity of ten-thousand liters of drinking water. 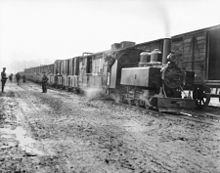 The box cars and tank cars were regarded as top-heavy and prone to derailment; so most loads were carried on flat cars and gondolas. Approximately 1600 4-wheel side dump cars were produced in several versions for construction earth-moving. Davenport Locomotive Works built one-hundred 15-tonne 2-6-2T and Vulcan Iron Works built thirty more. Whitcomb built 74 7-tonne 4-wheel gasoline mechanical locomotives. None of the Davenport, Vulcan, and Whitman production saw overseas service, but some survived through World War II on United States military bases including Fort Benning, Georgia, Fort Sill, Oklahoma, Fort Benjamin Harrison, Indiana, Fort Dix, New Jersey, and an arsenal in Alabama. During the first world war Russia used both French 600 mm (1 ft 11⁄8 in) Decauville and 750 mm (2 ft 5⁄2 in) gauge systems. More than 2000 km of narrow gauge trench railways were built during the war. Kolomna Locomotive Plant built 0-6-0T locomotives (I, N, R, T series). 70 locomotives were purchased from ALCO. Baldwin Locomotive Works built 350 seven-tonne 6-wheel gasoline mechanical locomotives for Russia's 750 mm (2 ft 5⁄2 in) gauge in 1916. Baker, Stuart (1983). Gas Mechanicals. Narrow Gauge and Short Line Gazette. DeNevi, Don and Hall, Bob (1992). United States Military Railway Service America's Soldier Railroaders in WWII. Erin, Ontario: Boston Mills Press. ISBN 1-55046-021-8. Dunn, Rich (1979). Military Light Railway Locomotives of the U.S.Army. Narrow Gauge and Short Line Gazette. Dunn, Rich (1982). Military Light Railway Rolling Stock of the U.S.Army. Narrow Gauge and Short Line Gazette. Picture - One of the military 2-6-2T pulling 4-wheel side dump cars for a Michigan construction project in 1921. Seidensticker, Walter (1980). Brigadeloks and Zwillinge in the Trenches. Narrow Gauge and Short Line Gazette. Small, Charles S. (1982). Two-Foot Rails to the Front. Railroad Monographs. Telford, Robert (1998). Belligerent Baldwins. British Railway Modelling. Westing, Fred (1966). The Locomotives that Baldwin built. New York: Bonanza Books. ISBN 0875645038. Westwood, John (1980). Railways at War. San Diego, California: Howell-North Books. ISBN 0-8310-7138-9.